Guildford Saints FC is situated in the Merrow area of Guildford. 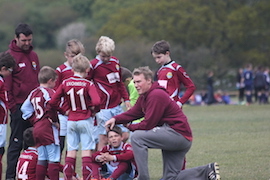 A Chartered Standard Development Club Formed in 1983, the club provides training and Sunday league football for children aged between 6 and 17 years. Over the past 5 years we have established a group of Professional Coaches, led by our Director of Coaching Kevin Wilson, who deliver training sessions throughout the age groups in our Club, both Saturday and mid-week sessions. The club welcomes new players in all age groups, to take part in our national sport, to become part of a team, to develop not only ball skills but also social skills, enjoy playing football and making friends. We have an established Ladies Sunday League Team plus a PAN Disability Team, affiliated with the Football for All league and a 45+ walking football team. New players welcome in all sections. All volunteers/age group Managers are trained to FA Level 1 standard or higher, they have all attended Child Protection workshops and are first aid trained. Find Team manager contacts here. Training is offered to all volunteers wanting to become involved with coaching or running a team. The club is run by a small group of volunteer parents who form the Management Committee. They provide the organisational structure for the club and ensure that there are sufficient funds to carry out training and development of players and Managers/coaches. Income for the club is derived from various sources, the majority coming from Membership fees, the remainder from social events, sponsored competitions, kit sales, and sponsorship. Sponsorship is used for purchasing team kits. Sponsors enjoy kit advertising for 2 years, plus coverage in the local press and marketing we undertake. We are always happy to hear from potential sponsors. Our current Club sponsor is Winkworth Estate Agents, we are very grateful for their support. The main expenditure for the club comes in the form of Professional Coaching fees and pitch hire. As the club does not have a central base we hire training facilities and match-day pitches from local schools and Guildford Borough Council. Other expenditure includes League registration fees, player registration fees, team kit, training equipment and affiliation to Surrey County FA.